New to EMC (electromagnetic compatibility) testing? Need to polish up your knowledge? This beginner's guide to EMC gives the concise information you need to identify, prepare for and ultimately pass EMC testing. 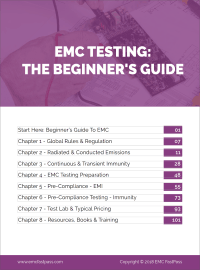 In this guide, you'll learn how to find the EMC standards that apply to your product, what the emissions and immunity tests are that you'll need to pass, how to prepare for testing, how to find good EMC test labs, typical pricing and much more. The beginner's guide to EMC is an in-depth tutorial on all aspects of EMC testing. This guide covers the fundamentals of everything you need to know to be able to navigate, prepare for and pass EMC testing. EMC (ElectroMagnetic Compatibility) testing exists to ensure that your electronic or electrical device doesn't emit a large amount of electromagnetic interference (known as radiated and conducted emissions) and that your device continues to function as intended in the presence of several electromagnetic phenomena. Regulatory bodies around the world have placed limits on the levels of emissions that electronic and electrical products can generate. Also, electromagnetic immunity testing is mandated for some areas and some product types. In the first chapter of this guide, we'll be digging into the applicability of emissions and immunity tests to your product, as well as determining exactly which standards apply. What is the Average EMC Testing Pass Rate? Statistics on this subject are few and far between, because EMC test labs and governments are not required to collate the information. However, one of the largest studies available, by Intertek Labs puts the first time pass rate at only 50%! A failure can easily cost a few days to several months time to market, so it's very important to prepare properly for EMC testing. 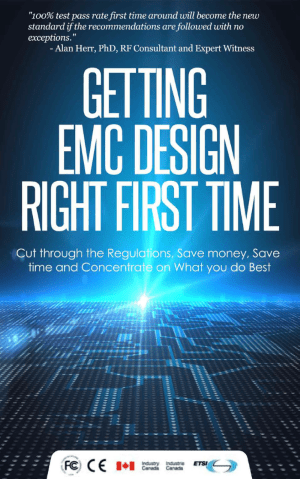 In this guide, I'm going to go into detail about the process of preparation and what you should be thinking about in terms of EMC design and pre-compliance testing. Do I need to care about EMC Testing? 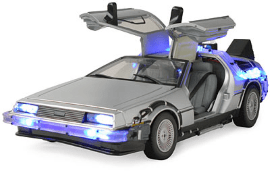 Although a few exemptions exist, if you design, manufacture or import products with electronics inside, then it's almost definite that you're going to need to care about EMC. We only have a finite amount of electromagnetic spectrum that we can use for things like radio transmission, microwave communication, x-ray machines and a huge number of other products. Unfortunately, even electronic devices without transmitters emit electromagnetic radiation, just as a byproduct of switching currents and voltages inherent to electronic circuitry. Without limits to the amount of unintended electromagnetic radiation from electronic products, the electromagnetic spectrum could be adversely affected and frequency bands reserved for radio transmission could become compromised. As the number of non-wireless and wireless electronic products continues to explode, the already packed electromagnetic spectrum is going to become even more crowded. Protection of this essential resource is critical to ensuring that devices continue to be able to function properly in the future. For many products and industries, EMC performance can mean the difference between life and death. Many medical, military, industrial, aerospace and automotive products (and others) have safety critical applications. If the function of those products fail due to electromagnetic phenomena such as power supply surges, ESD or radiated electric fields, then lives can certainly be at risk. Imagine 300 cellphones all transmitting 7 Watts of power on an aircraft at 36,000 feet - it's rigorous EMC testing that ensures that the electrical systems can withstand those sorts of electromagnetic environments. The function and performance an electronic product can easily be affected by external and internally generated EMC phenomena. As an example, if your internal power supply regulation is too noisy, that can adversely affect sensitive analog measurements (for sensor products), or lower the performance of a radio transmitter (for wireless products). Those are both examples of internal EMC problems. Externally, applied EMC phenomena can negatively affect products in a virtually unlimited number of ways, from data corruption to measurement accuracy to RF performance to frying ICs. EMC testing helps to ensure that your device will continue to function as expected in the presence of a typical EMC environment and (hopefully) reduce the amount of product returns to poor EMC performance. Given the well documented variability of lab to lab EMC testing results, the large testing price tag that applies regardless of the quantity of sales or size of the company and the shear volume of non-compliant devices that enter the market every year, it's easy to see how manufacturers can get cynical about the whole process. An official 2013 report of non-compliance across Europe stated: >35% technical requirements non-compliance and >60% documentation non-compliance. It's true that EMC testing can be a huge burden to small and large manufacturers alike and its effectiveness can sometimes be questionable. But the rules did emerge as a result of real problems (see history below) and the government and private infrastructure grew to accommodate and enforce those rules. If you're caught with a non-compliant device on the market, the fines and actions can vary from insignificant to horrendous. Legal firm Fish & Richardson published a summary of the FCC's legal proceedings over the last few years and the results were interesting. Most fines were related to issues with wireless transmitters, rather than unintentional radiators. Penalties varied from 'admonishment only' to $2.2m. Enforcement seems to be fairly minimal, as evidenced by a non-compliance rate of approximately >60% in parts of Europe on a sample size of 10,000 products. However, there are several risk areas relating to non-compliant devices covering both civil and criminal law. You can find a good presentation on the legal aspects of compliance here. The most likely ways to be caught with a non-compliant device on the market include competitors notifying authorities, market surveillance and finally customer complaints due to interference with other devices. One of the first EMC regulations were originally formed way back at the turn of the 20th century in Europe in response to specific problems that arose from usage of electrical devices. Defective electric lamps caused other lights in the neighbourhood to 'flicker'. This was back in the days when electric power grids were new to London, England and some other wealthy places. To curb this problem, probably the first EMC legislation was enacted, called "The Lighting Clauses Act" of 1899! Germany may have beaten the UK to the post with their 1892 "Law of the Telegraph in the German Empire" which dealt with influences of EMC disturbances on products and installations in the field of telegraph communications. This was a result of the discovery that communication cables could negatively affect each other. The FCC has had limits on transmitter emissions since 1938 and has continued to expand its rules in response to the explosion of transmitters and electronic devices over the following decades. The rules were getting a little sprawling and uhh.. unruly, so in 1989 the FCC standardized emission limits for general applications. The EMC directive was introduced in the EU in 1992 which was designed to standardize requirements across the EU member countries and free up the movement and electronic goods. There is a concerted effort to standardize EMC testing requirements across the world, led primarily by the IEC (International Electrotechnical Commission). The IEC generate standards that can be transposed by countries into their local standards and in theory this standardizes the EMC requirements across all of the regions that adopt IEC standards. In the UK for instance, 85% of IEC standards are transposed to UK standards. In some countries, such as the US and Canada, currently only emissions testing is required (unless your product falls under the scope of an industry specific standard that calls out immunity testing). Whereas in Europe, both emissions and immunity testing are mandated. Over the past few years, countries such as Australia and New Zealand have followed Europe's model and necessitate immunity testing as well. The push from test labs, government and international standards (discussed above) all indicate that requirements for immunity testing is increasing. This can easily double or triple testing costs compared to emissions only testing, as well as increase time to market by several days or weeks if a failure is encountered. Recently announced new rules for EMC test labs by the FCC mean that transmitter 'certification' testing will only be accepted from recognized and accredited test labs. Approximately 2/3 of the 1000 or so test sites registered with the FCC are currently not accredited. The extra requirements are likely going to favour larger test labs that can absorb the accreditation overhead costs and staffing and may force smaller test labs out of business. You can read an in depth analysis on this topic here. Thanks – lots more to come! Great work! Chapter one has good summary for important EMC links! Very interesting indeed, going to read through your papers and compare to my own experiences here in Canda. Cool, drop me a line anytime. You mention above that “in Europe, both emissions and immunity testing are mandated.” For any product required to meet the European EMC Directive, this is not true. In reality EMC testing is an option only. Compliance with EMC test standards can only, at best, only give a presumption of conformity with the Directive. Hi John. yes you have a point – will fix up the article to highlight that emissions and immunity testing is only the preferred method of proving/ensuring compliance with the EMC directive for *most* legitimate manufacturers. I’m impressed that your comment comes from someone who is involved with an accredited EMC lab. Normally this information is obfuscated by labs in an effort to get more business. Excellent work. Congratulations. Talking of obfuscation, are there any figures on expected costs at a testing lab? I understand that there may be a variation in fees, and I am looking at a product that has been well tested and shielded, before going to the lab. The lab requires a few hours (1/2 day) to test and certify, say to fulfil ICNIRP or FCC Chapter 15 standards. Hi David, check out chapter 7. Cheers. You reference broad sources of nomenclature, requirements, and testing facilitation. It’s what I need to become a wireless shark. I came from old HP EMC labs and the goodies in your chapter 8 will help me to sharpen my senses to improve pass rates. If ever you come to the SF bay area, look me up and we can swap stories. Thanks Dennis, will give you a shout next time I’m down your way! If I have FCC, RoHS, and CE certifications, will I need any other certifications for the device that has bluetooth function, but is not actual bluetoth device. I mean, bluetooth has peripheral function on it. Very thanks for using simple words to explain one so complicated problem. good work, could you give some hint about ” Design EMC guideline for workshop machineries”. What are the advantages of using Anechoic chamber over GTEM cell ? Precompliance testing testing with GTEM cell is comparatively less but should we go for GTEm cell for precompliance testing. But as you say, GTEMs are cheaper. I would go with a compact semi-anechoic chamber if your budget allows for it. In my experience getting the support equipment out of the GTEM is often easier than getting it out of the AC, as the lenght of cables need to be longer. Of course each to their own. If you are only going to test EUTs of around 50cm x 50cm x 50cm then I think the GTEM is the best option. The cost of the chamber/GTEM isnt the only consideration the running equipment for a GTEM will be less that that of an AC, the antennas are less for the GTEM as they are fixed, hence the cableing etc is much simpler. Sorry, real novice here and trying to make sense of the new Regs. Could anyone confirm if testing is required when the handbrake of a vehicle is applied (vehicle immobilised) and system operated. I read this in VCA documentation but now desperately trying to relocate it. Regarding the need to register products on the ACME database for Australia. I assume if a device is compliant to the EMC standard (IEC 60601-1-2), issuing a DoC and registering the product is all that is required. Do you agree? Can you provide additional information to clarify? Is switch racks consists of dry typr transformer,cpt,indication lamps etc. are required to be having EMC test? Kindly advice a statement to justify why it is not applicable .